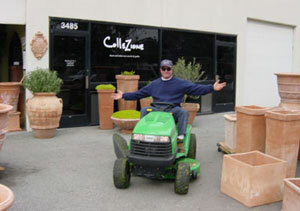 ColleZione has over 130 styles and sizes and, inevitably, some are not shown on this web site. We frequently receive new shipments including new styles or sizes, so call or email if you are looking for a particular item and don't see it here. You can purchase a full color catalog of our current collection, which includes retail pricing, for $5.00; this figure will be deducted from your first order. If you wish, you may download a color catalog by clicking the right section of this page. Please note that our downloadable catalog does not include prices. For pricing, call, email or fax our office; we can provide prices and availability either on the telephone or by sending you an email or fax. Clicking the Buy Now button below will take you to a different website (PayPal), where you will provide your credit card and related information; you will then be directed back to ColleZione's website to conclude your transaction. We will mail your catalog within 7 days of your purchase. We thank you for your interest in our products. Friends and neighbors dropping in at the ColleZione showroom.